Temperature measurement does not need to be intrusive and upsetting to patients. 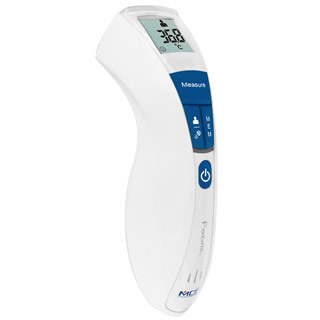 With the MDF® Febris™ Touch-Free Infrared Thermometer Touch-Free Technology, simply point towards the forehead and you'll get an instant and accurate reading. So say goodbye to the old fashioned methods (rectal, oral, ear, and auxiliary) that can often be inaccurate and distressing to feverish patients, especially fussy babies. With Touch-Free Technology there is no contact with the patient, so it is perfectly hygienic and eliminates cross-contamination. And since there is no need for probe covers, there is no more waste, so it's better for our environment. Track measurements over time with 10 stored readings.